I am looking at this and there is alot of stuff that just look like a 5e setting. Like the list of spell and magic item make me feel like they are copy and past from the player guide and the DM guide. I made an attempt to acquire the hardbound copy from my local game store and though it appeared in the distributor's catalog, the proprietor has not been able to find one anywhere. Any idea of when the distributors will be getting more copies? My LGS has found a copy at one of its distributors; I should be able to get it shortly! By the way, is there a way to tell premium apart from standard printing? I wouldn't put it past certain distributors to sell a standard copy at premium prices! I am intrigued by this game, but am hesitant to pay $11.99 until I know what it looks like. If you could add a free quickstart document, with the basic rules to begin playing, but without a lot of the content, that would be great. "The Secret of Vinsen's Tomb" is what you are looking for. It's not for free, but costs only 1,99$. What's the difference between the "premium" and "standard" hardcovers? Anywhere we can see pictures? I bought this a while ago, and finally received the book. I wanted to test my creation skills and set up a Prequel adventure (escorting young pups from the Pioneer Puppies Program) for some of my friends. It lasted about three sessions when they went off-grid! I started The Great Cat Conspiracy with my PDs (Player Dogs) meeting Heinrich Doberman. Any idea where I can get miniatures, even paper ones? He's done paper miniatures for JadeClaw and IronClaw already. I made some little paper ones from a bunch of dog images. My players love them! Oathsworn in the UK make figures that would work well with this setting. While the dogs in Isle of Dogs are intelligent and talk, they are regular dogs. 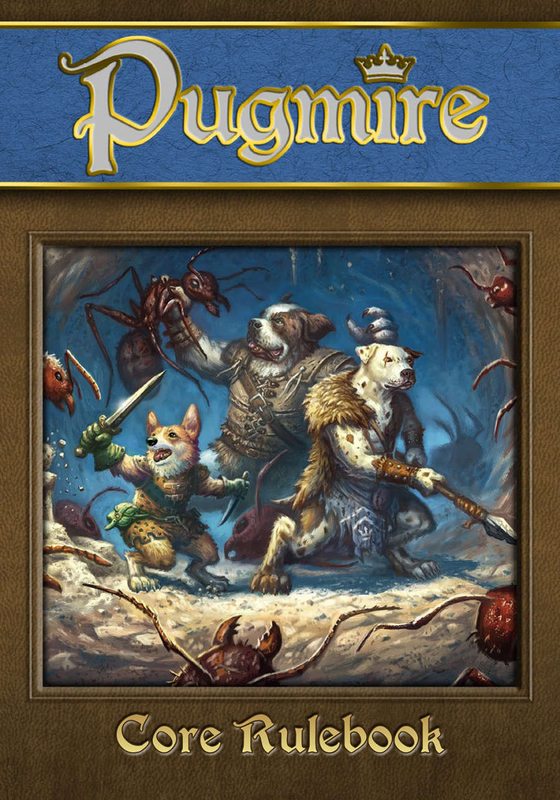 The dogs (and others) of Pugmire are upright bipedal anthropomorphic animals that talk, wear clothes and armor, and use swords and magic. So is this an RPG based on the works of Wilum Hopfrog Pugmire, "punk rock queen and street transvestite"? I realize this is an old comment, so maybe it's resolved by now, but I just picked up the Print+PDF and the print version's quality is really solid. I did Standard Heavyweight (color) and I'm very happy with it. This after getting the Standard Heavyweight V20 and being less than thrilled with that one, so obviously some quality issues have been improved. I am strongly tempted to buy this in print when it comes out as a gift for my niece, but I would like to look a little at the contents first. Would there be a way you could post the table of contents and maybe a few pages here and there from random chapters to give me an idea of how its laid out and works? Eh? The "Full Size Preview" link has the TOC and several pages.